Computers contain memory, much as your own brain contains memory. The computer’s memory stores information that you create using MATLAB. Looking at memory as a kind of storage locker can be helpful. You open the door, put something inside and then close the door until you need the item again. When that happens, you simply open the door and take the item out. Whenever you tell MATLAB to store something in memory, you’re using a variable. Developers use the term variable to indicate that the content of the memory isn’t stable — it can change. MATLAB always needs a place to store the output of any calculation you perform. For example, when you type 2 + 2 and press Enter, the output tells you that the value is 4. However, it more specifically tells you that ans = 4. MATLAB uses ans as a storage locker when you don’t specify a specific storage locker to use. MATLAB uses ans as a temporary storage locker. The content lasts only as long as you keep MATLAB open and you don’t perform another calculation that requires ans to hold the output. If you need the result from a calculation for additional tasks, you must store the result in another variable. Whenever you need to use the result of a calculation in future calculations, you must create your own storage locker to hold the information; using the ans temporary variable just won’t work. Fortunately, creating your own variables is straightforward. You can create your own variables that you can use for storing any MATLAB information you want. Always make variable names meaningful. Even though a variable named x is easy to type, remembering what x contains isn’t so easy. A name such as CosOutput is much easier to remember because it has meaning. At least you know that it contains the output from a cosine calculation. The more meaningful you make the name, the easier it will be for you to later determine what a calculation does. You need to type command and function names precisely as described in the MATLAB documentation because MATLAB is case sensitive. Variable names are also case sensitive, and this is one of the ways in which many users make mistakes when creating a script. The variable myVariable is different from MyVariable because the case is different. Avoiding the use of existing MATLAB names such as pi, i, j, sin, cos, log, and ans is essential. If you don’t know whether a particular name is in use, you can type exist(‘variable_name’) and press Enter. Try it now with pi. Type exist(‘pi’) and press Enter. You see an output of 5, which means that the variable is in use. Now, type exist(‘MyVariable’) and press Enter. The output is 0, which means that the variable doesn’t exist. MATLAB lets you create case-sensitive variations of existing variables. For example, type Ans = ‘Hello’ and press Enter. 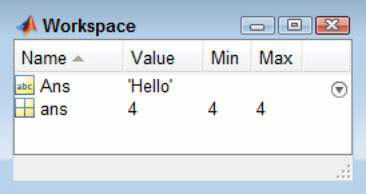 You see that the Workspace window now displays two variables, ans and Ans. Using a variable with the same name but different capitalization as an existing MATLAB variable will cause you problems. You’re better off to simply avoid any existing term no matter how you capitalize it.